The development of refrigeration is a priority in all countries, given the multidimensional roles that it plays in the sustainable development of society. In developing countries, efforts are being made to catch up with the delayed experienced in the use of refrigeration. To achieve this goal, several countries are allowed to trace the history of refrigeration in their countries in order to understand the main causes of non-expansion, and then set up a new strategy of sustainable development for this technology. The Democratic Republic of Congo (DRC) is a developing country that has experienced a very interesting history of refrigeration, but is still less known by the Congolese themselves as well as by scientists. This paper has traced out the outline in the history of refrigeration in the DRC. Surveys were conducted in the industrial, health, residential, commercial, and tourism sectors during the colonial and post-colonial period. Results showed that the use of refrigeration in the DRC has been remarkably observed in the industrial sector, especially in breweries, with a cooling capacity ranging from 50.1 thousand to 2.88 million kWh, about 5 659 % between 1929 and 1957; from 3 million to 26.5 million kWh, about 783.3 % between 1958 and 1980, and then dropped to 6.5 million kWh in 2004 before resuming its growth up to 11 million kWh in 2009. The variations in the use of refrigeration during the above periods significantly influenced the economy, in the sense that the economic and social indicators of the country grew from 0.415 to 0.430 between 1975 and 1985, and then declined to 0.375 in 2000, due to political instability, before rising up to 0.410 in 2005. In prehistoric times, man found that the game killed in the hunt would last longer if it was stored in the coolness of a cave or packed in snow. Later, ice was harvested from lakes and rivers and stored to be used in summer. As man became more industrialized and mechanized, cooling requirements in industrial processes and other sectors became more and more important. This led to a technological revolution in refrigeration. However, the evolution of refrigeration technology was slow and difficult until the invention and development of electricity in the 19th century, which boosted the development of technology based on vapour compression (Arora, 2000) that subsequently became more competitive worldwide. The growth of refrigeration technology and its applications has enabled many countries around the world to achieve sustainable development. Its impact may be appreciated through social, economic and environmental dimensions. In society, the refrigeration sector generates jobs. According to the International Institute of Refrigeration report (IIR, 2002), the refrigeration sector employs more than 2 million people worldwide, particularly in industrial and commercial areas. Refrigeration is essential to human life. In the food sector, refrigeration contributes to reducing post-harvest losses by allowing perishable foods to be preserved at all stages from production to consumption (Laguerre et al., 2013; Tassou et al., 2010; Wang and Wang, 2005). In the health sector, refrigeration is used for vaccine storage (McCarney et al., 2013), and new medical equipment and tools (Langenhuijsen et al., 2009; Polascik et al., 2007). Apart from its primary function of producing cold, refrigeration is used for air conditioning by creating comfortable living and working environments (Fanger, 2001; Ji et al., 2003). In the economy, refrigeration plays an important role in national and international businesses. It enables the storage of perishable commercial products and facilitates their sale to distant markets (Tassou et al., 2010; Wu et al., 2013). Refrigeration is necessary to the development of energy sources (Trivedi et al., 2013; Yang et al., 2013). Many industries (chemical, pharmaceutical, agri-food, manufacturing, etc.) require refrigeration for their operation (Sanzida and Nagy, 2013; Sun and Zheng, 2006). Refrigeration has some environmental benefits worth mentioning. It helps to maintain biodiversity by allowing the cryopreservation of genetic resources: cells, tissues, organs of plants, animals, micro-organisms (Benelli et al., 2013; Wang et al., 2012). The impact of refrigeration throughout the world is more meaningful than is generally believed. There are about 1 300 million household refrigerators (more than 80 million are produced annually), 340 million air-conditioning units, and 350 million m3 of cold-storage facilities operating worldwide. The investment gap in this technology between developed and developing countries remains wide, for example, in the total annual production of household refrigerators, only about a third is traded in developing country markets (IIR, 2002). The fundamental reason for this imbalance is the underde-velopment of electricity (Meincken, 2012; Udochukwu and Ogbonnaya, 2014; Lloyd, 2014), which is the main energy source for the majority of refrigeration technology. According to the World Energy Outlook (IEA, 2014), 1.3 million people continue to live without access to electricity. This is equivalent to 18% of the global population and 22% of those living in developing countries. Nearly 97% of those without access to electricity live in sub-Saharan Africa and developing Asian countries. In sub-Saharan Africa, the most affected countries are: South Sudan (99%), Liberia (98%), Central African Republic (97%), Chad (96 %), Sierra Leone (95%), Malawi (91%), and the Democratic Republic of Congo (91%). Apart from the lack of electricity, poverty caused by economic and political instability must also be added to the problem since it does not allow the population living in electrified cities to acquire household refrigerators. According to the Millennium Development Goals Report (2013), 1.2 billion people in the world still live in extreme poverty. In the Sub-Saharan region, 48.4% of people live on less than 1.25 USD a day, in comparison with Latin America where only 4.5% of the population lives with less than 1.25 USD daily. The underdevelopment of refrigeration technology in developing countries has resulted in an increase of the mortality rate, due to the lack of vaccine storage (McCarney et al., 2013), diseases caused by the consumption of spoiled food (Yu and Nagurney, 2013), the difficulty of cryotherapy (Mohammed et al., 2014), etc. According to the Millennium Development Goals Report (2013), in Sub-Saharan Africa, one in nine children die under the age of five, more than 16 times the average for developed countries. In addition, in 2011, an estimated 6.9 million children, 19 thousand a day died from mostly preventable diseases. From the nutritional point of view, perishable foodstuffs represent 31% of the total volume of foods consumed in developing countries. But, only 1/5th of perishable foodstuffs is refrigerated (IIR, 2002). This means that high losses are incurred following harvest, slaughter, fishing, milking, then during transportation and finally during sale. The details provided above sufficiently demonstrate the role that refrigeration has to play in the sustainable development of developing countries. Today, several developing countries are mobilized to find lasting solutions to the problem of electricity and refrigeration. In sub-Saharan Africa, considerable efforts are noticed in some countries such as South Africa, Ghana, Capo Verde, Botswana, etc. (IEA, 2014). In the DRC, despite the precarious situation of electrification in rural and urban areas, which today hampers the development of refrigeration, it should be noted that this past was dominated by a growth in refrigeration in some sectors, but history is not so much known to the public. This paper presents an overview on the use of refrigeration in the DRC from colonial times to the current period by demonstrating the role it has played in the socio-economic development of the Congolese people. The DRC, a former Belgian colony, is the second largest country in Africa after Algeria and the largest one in the Sub-Saharan region with 2 345 000 square kilometres. It is bordered by the Central African Republic and South Sudan to the north; to the east by Uganda, Rwanda, Burundi, and Tanzania; to the southeast by Zambia; and to the southwest by Angola. To the west are the country's short Atlantic coastline, the Angolan exclave of Cabinda, and the Republic of Congo (see Figure 1a). Its population is about 70 million (Census Bureau-US, 2013). The country is divided into ten provinces and one city-province (see Figure 1b). The provinces are subdivided into districts, which are divided into territories. This section traces the history of refrigeration applications in the DRC by demonstrating the role it has played in the country's economic recovery. The facts are divided into two stages, namely: the colonial and post-colonial period. The use of refrigeration technology in the Democratic Republic of Congo dates back to the late 1920s, particularly in the health and food industry sectors. The refrigerants belonging to the family of chlorofluorocarbons (CFCs) and specially CFC-12 were the first to be used during this period (ODM, 2013). 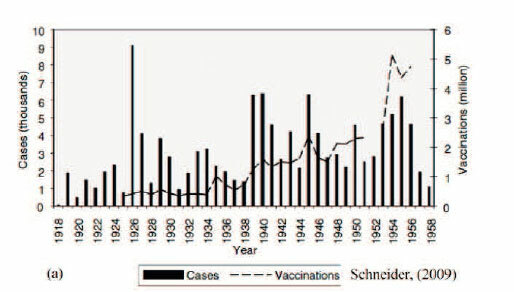 In the health sector, refrigeration was used for preserving vaccines against smallpox (Schneider, 2009). Figure 2a shows the evolution of smallpox immunization in the DRC during the colonial era. As can be seen, the vaccination program against smallpox began in the DRC in 1925. During this campaign, 400 000 infected people were vaccinated, which represents a total of about 40 litters of vaccines (0.1 ml of vaccine per person). However, considering the storage temperature of vaccines against smallpox, which ranges between 2 °C and 8 °C (Lee, 2006), the estimated cooling capacity of the vaccine storage equipment is evaluated through a thermodynamic analysis of a compression refrigeration cycle working with CFC-12. The results are presented in Figure 2b. 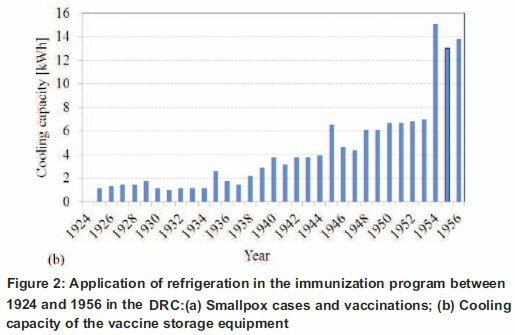 The tendency of the curve leads us to believe that the use of refrigeration in the vaccination program has enabled a significant reduction in infection rates of smallpox in the 1950s. Apart from the application in the immunization program, refrigeration has played an important role in the brewing industry during the colonial era. Refrigeration is the main process in the fermentation, maturation and packaging of beer (Sturm et al., 2013; Muster-Slawitsch et al., 2011; Braeken et al., 2004). In the DRC, breweries were among the first industries established by the colonial power. The first two Congolese brewing companies of Leopoldville (now Bralima) and Brasimba (Brasseries Simba) were created 15 years after the country was occupied by Belgian colonists. The brewery of Leopoldville was founded on October 23, 1923 by a Belgian industrial group under Brussels Bank financing (Luboya-Kasongo, 2007). While for Brasimba, its creation took place on December 08, 1923 in Elisabethville (currently Lubumbashi), on request of the Belgian workers at the Upper Katanga Mining Union (Union Minière du Haut-Katanga), addressed to a Belgian industrial group (Mukenga, 2010). After the growing consumer demand patterns of these two breweries, they quickly extended their actions creating several other plants in the provinces. During the 1950s, other independent breweries (Kisangani, Kasaï, Bas-Congo and Isiro) were established. The increase in the number of brewery companies led to a significant growth rate of beer production, and consequently an increase in the capacity of refrigeration in brewing processes. 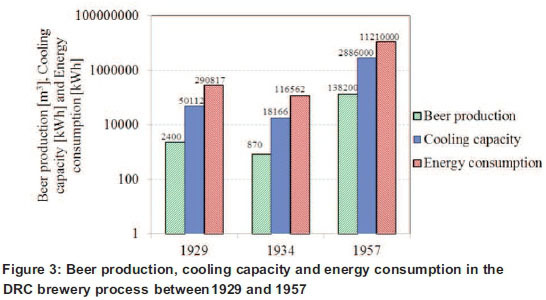 As it can be seen in Figure 3, beer production, cooling capacity and energy consumption experienced a high increase in 1957, about a 5 659% growth rate, in comparison with production in 1929. The decline registered in 1934 was due to the difficulty experienced in the management of the brewery of Leopoldville (Lutete, 2005). 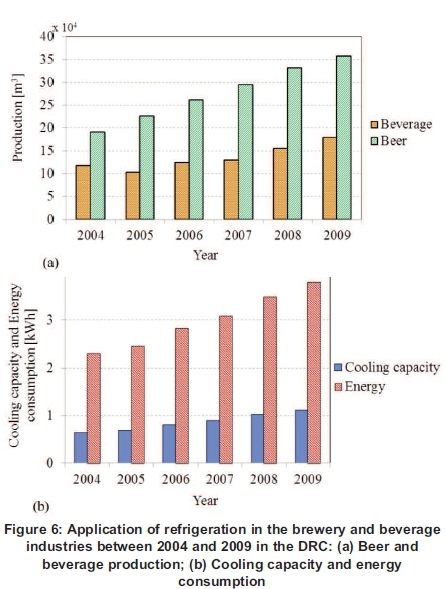 In the previous figure, the cooling capacity was evaluated considering the thermodynamic conditions recommended for fermentation, maturation and packaging of beer (Sturm, 2013), and the refrigerant taken into account is the CFC-12; while for the consumption of energy, Felgentraeger and Ricketts (2003) correlation is used as described in Equation (1). where Ebeer is the energy consumption in the brewery industry (in MJ) and Vb is the beer volume (in hl). Besides the brewing industries, refrigeration is also used in beverage factories. The results of the study conducted by Buelens and Cassimon (2013) show that in 1957, the industrial production of lemonade and water in the Belgian Congo was about 32 000 m3. This represents approximately 668 161 kWh of cooling capacity and 3 million kWh of energy consumption. However, the total cooling capacity of refrigeration equipment in the food industry can be estimated at 3 558 161 kWh in 1957 and the corresponding energy consumption approximately 14.2 million kWh. Achievements made i n the food sector were not sufficient since refrigeration was not developed in other food areas such as the greengrocer, fishery and meat industries. This was due to the agro-industrial policy applied by settlers which was focused on the production of cash crops for export instead of food production (Jensen, 2012). Apart from the food and health sectors that experienced refrigeration shortly after the takeover of the Congo by the colonial power, other sectors such as residential and commercial did not experience the same situation. The use of refrigeration in the residential sector began in the DRC in the 1950s. The use of this equipment was essentially reserved for settlers and expatriate officials. This restriction was an obstacle to the development of refrigeration during the colonial period. Similarly, the Congolese commercial sector had not experienced significant development in refrigeration during the colonial period, due to the type of trade applied by settlers, which was centred on the export of mineral resources and cash crops (Buelens and Cassimon, 2013). The development of refrigeration was intimately linked to electricity. Provinces that have experienced the development of refrigeration (especially in the brewing industry) were those in which electricity has been developed. Table 1 shows the different hydropower plants built during the colonial era and some plants whose construction was started before independence. The total installed capacity of these hydropower plants is about 630 160 kW. Despite this important access to electricity, Congolese rural areas had remained without electricity during the entire period of colonization. Some Congolese living in slums did not have access to electricity (Kaplan, 2007; SNEL, 2013). This situation was a major constraint to the development of refrigeration. The inventory of refrigeration in the post-colonial period is characterized by a widening of its scope in almost all sectors of activity, despite the slow startup that the country had experienced shortly after independence due to the unpreparedness of Congolese administrators during the colonial time to ensure the continuity of public affairs (Kaplan, 2007). The technology of refrigeration used in the early post-colonial years was dominated by mechanical compression machines working with refrigerants belonging to both hydrochlorofluoro-carbons (HCFCs) and chlorofluorocarbons (ODM, 2013; WMO, 2011). The development of refrigeration during the post-colonial period was far more influenced by the country's political stability. Several socio-political events (war, political crisis, looting, etc.) occurred throughout the post-colonial period were the basis of instability in the refrigeration use. Indeed, after the political instability experienced by the country in the first five years of independence (1960-1965), the political recovery realized by President Mobutu Sese Seko (from 1965 to 1980) has led to socioeconomic development of the country (FMI, 2010). In the industrial sector, food industries experienced significant growth in production compared to the colonial period. In brewery industries (see Figure 4a), the growth rate of beer production between 1964 and 1980 was about 63.80%. 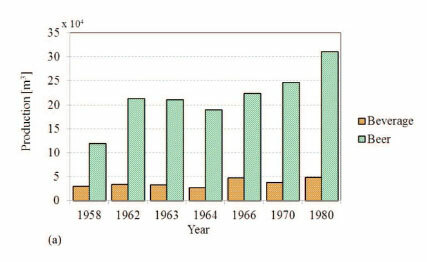 While in beverage, despite the decrease of production in 1967, the growth rate between 1964 and 1980 still remains important (about 80%) (Mukenga, 2010). Increasing beer and beverage production involves a growth in the cooling capacity of refrigeration equipment used in fermentation, maturation and packaging processes. Figure 4b shows the cooling capacity of refrigeration equipment used in the brewing and beverage process between 1958 and 1980 and the corresponding energy consumption. 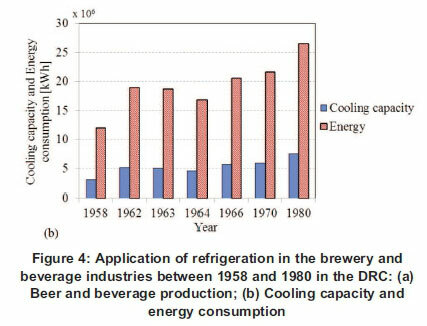 It can be seen in this figure that cooling capacity and energy consumption in the brewery and beverage industries experienced an important growth between 1958 and 1980, despite the decline recorded in 1964 (CES, 1969). Refrigeration took active part in the consolidation of purchasing power of the population in the DRC after independence. This is evidenced by its significant applications in the manufacturing processes of beverages and beers. The contribution of brewery and beverage industries in the economy of the DRC was considerable in the early years of independence. In 1964 added value of breweries was up for 8 million USD, which represented 39% of the total value added by industries supplying the Congolese interior market (CES, 1969). The achievement realized in breweries as well as in mining and other sectors has allowed the government of President Mobutu to increase the country's economy. But, this growth was not sustainable; in the 1980s the country fell back in the economic crisis. The main cause of this collapse was the 'zaïrianisation' decision taken in November 1973 to redistribute economic assets (businesses, plantations, etc.) held by expatriate to the politico-commercial elite close to the regime (PNUD, 2004). 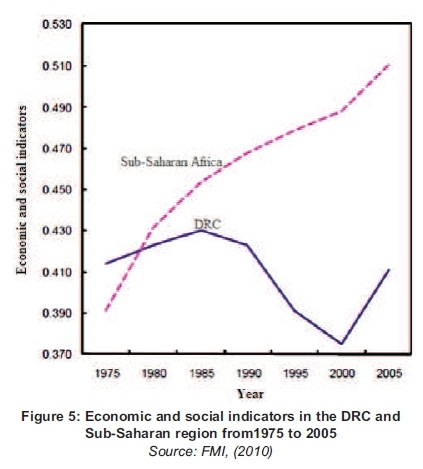 The poor management of companies attributed to Congolese business men and the decline of public investment led to the fall of the purchasing power of the population. In 1990, economic and social indicators fell to 0.40, and continued to decline until the early 2000s (see Figure 5). The decline in the purchasing power of the Congolese population has had an impact on the development of refrigeration in a number of sectors. Cooling capacity had significantly been reduced in the 2000s. In 2004 (see Figure 6), beer and beverage production experienced a fall of around 20% compared to 1980 (see Figure 4). In addition, the growth rate is low, with only 70% between 2004 and 2009. The decline in the purchasing power of the Congolese has had an impact on the development of refrigeration in a number of sectors. Cooling capacity has significantly reduced in the 2000s. In 2004 (Figure 6), beer and beverage production experienced a fall of around 20% compared to 1980 (Figure 4). In addition, the growth rate is low with only 70% between 2004 and 2009. 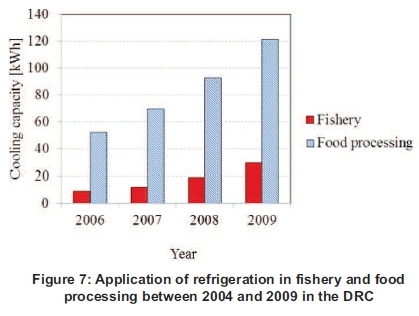 Apart from the brewery and beverage industries after the crisis period, the Congolese food industry was also expanded into fishery and food processing thanks to the development of refrigeration as it can be observed in Figure 7a. Between 2006 and 2009, the cooling capacity in fishery and food processing experienced an increase of about 221.3% and 133.3%, respectively (WMO, 2011). The economic reorganization performed after the crisis has also enabled the development of refrigeration in the residential and commercial sectors. 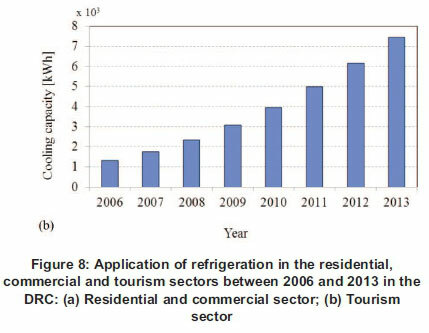 Figure 8a shows the estimated cooling capacity in the residential and commercial sectors between 2006 and 2013. 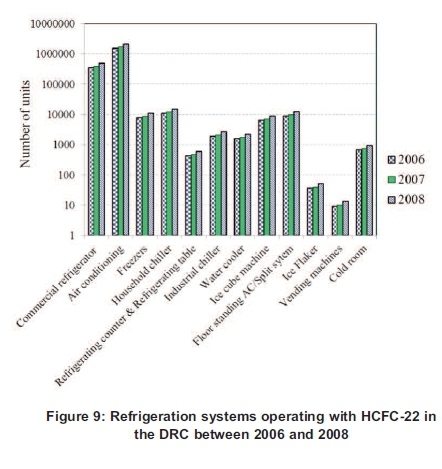 The data used in this analysis comes from an inventory realized by the Congolese government on the use of refrigerants belonging to the family of HCFCs in the residential and commercial sectors between 2006 and 2008, with a projection from 2009 to 2013 (WMO, 2011). This inventory was part of the proposal of HCFC phase-out in the DRC as recommended by the Montreal Protocol. 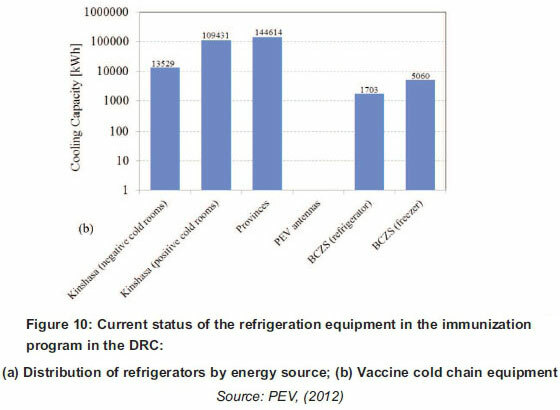 According to this report, the residential sector in the DRC holds 35% of the refrigeration technology working with the HCFC-22. Besides the residential and commercial sectors, tourism in the DRC is an area in which refrigeration plays an important role (MECNT, 2012). 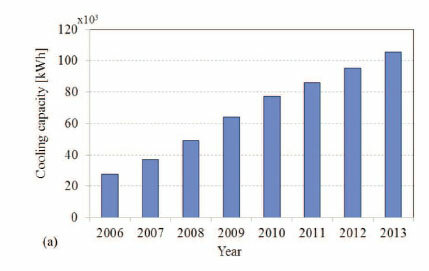 The inventory realized in this sector between 2006 and 2013 (see Figure 8b) reported a growth rate in the use of refrigeration of about 436 % (WMO, 2011). The period from 2006 to 2013 was marked by a special event in the field of refrigeration in the DRC. In 2010, refrigerants belonging to the family of CFCs were completely eliminated in Congolese sectors. However, hydrochlorofluorocarbons have remained the main refrigerants in the DRC (WMO, 2011). In residential and commercial sectors, HCFC -22 is the most widely used refrigerant (about 93%). It is used in several types of refrigeration technology as can be seen in Figure 9, which presents the results of an inventory realized in 2006, 2007 and 2008. It follows from this inventory that more than 2 million units operate with HCFC-22. A total of 1 893 849 units were identified in 2006, 2 104 277 in 2007 and 2 630 346 in 2008 representing a growth of about 25%. As result of the inventory, air conditioning and commercial refrigeration are the most used in the DRC. Another sector that requires particular attention is health care. It is well known that refrigeration plays an important role in the health field. Unfortunately, in the DRC refrigeration is not at all developed in the health sector. Its applications are limited in hospitals and health centres located in urban areas, and in the Enlarged Program of Immunization (Programme Elargi de Vaccination: PEV). The PEV remains the only area of health care where refrigeration is developing (PEV, 2012). This is due to the requirement of the World Health Organization (WHO), which demands the government of each country to be equipped with a program to fight against preventable diseases (WHO, 2012). The refrigeration technology applied in the immunization program in the DRC is vapour compression. Three different energy sources are used to power these machines: electrical energy from network, solar energy and Kerosene. 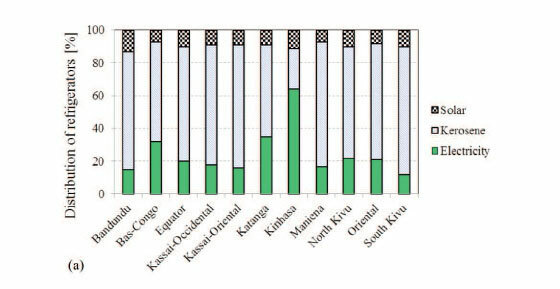 Figure 10a shows the distribution of refrigerators by energy source in each province. It becomes clear that Kinshasa is the only province where electrical energy from the network is more used for vaccine storage, because of its political position as the DRC capital. In all the other provinces, more than 50% of cold chains are powered by Kerosene, which poses problems for its supply in rural centres. Solar energy is only about 10% of feed rate, despite the high availability of solar radiation that the country abounds. Moreover, the cooling capacity of cold chains installed in each centre throughout the country is shown in Figure 10b. The results are presented according to the sub-division of PEV activities (namely in Kinshasa, provinces, PEV antennas and Central Offices of the Health Zone and health centers (BCZS)) and depending on the application. The data used in this analysis comes from an inventory realized in 2011 by PEV (PEV, 2012). The overall cooling capacity of vaccine cold chain equipment in 2011 is approximately 274 337 kWh. The outline in the history of refrigeration and its impact on the sustainable development in the DRC was set out in this paper. Surveys were conducted in two periods in the colonial and post-colonial period. The results sufficiently demonstrated that refrigeration had played an important role in the socio-economic development of the Congolese people before the period of crisis. In the colonial era, refrigeration had played an important role in the brewing industry and the health sector. The growth rate of the cooling capacity in the beer production process has positively affected the socio-economic level of the population by increasing their purchasing power. In the health sector, the use of cold chain in the smallpox immunization program has led to saving human lives. But, its impact was not significant in the residential and commercial sectors due to the political and agricultural systems imposed by the settlers. In the post-colonial period, refrigeration took an active role in rebuilding the Congolese state. Its impact was highly significant on the purchasing power of the population before the period of crisis. The increase in the refrigeration capacity in the brewery, fishery, tourism, food processing, residences, and health care industries, are examples which demonstrate how refrigeration has contributed to the sustainable development of the DRC after independence. Today, after heavy destruction of the economy due to looting and different wars that the country experienced in the early 2000s, a significant reduction in refrigeration applications is recorded in all sectors. In the health sector, children are dying due to the lack of vaccines since there is no equipment to keep vaccines cold in rural areas. These few examples show that efforts should be made in the DRC in the field of refrigeration to save human lives. To solve this problem, the government of the DRC must establish in a short term a sustainable development program of refrigeration in all sectors. This program must be accompanied by a development plan for renewable energy such as solar energy in rural areas. Health centres should be reequipped with refrigerators powered by solar photovoltaic panels for vaccine storage. On the other hand, the private sector must also contribute to the development of the refrigeration by building cold rooms in urban and rural areas to promote food preservation. Census Bureau-US (2013). International Data Base; no data; [ Links ] [updated no data; cited 2013 December 19]. Available from: http://www.census.gov/population/international/data/idb/region.php?N=%20Results%20&T=13&A=separate&RT=0&Y=2013&R=-1&C=CG. Lutete, M., Supplement, Hans Van Mameren, (2005). Administrateur Délégué [Internet] ; Bralima a consolidé sa réputation et sa position de leader. Kinshasa (DRC). Le Potentiel; [ Links ] [update no data ; cited 2005]. Available from: http://www.stanleyville.be/documents/Histoire%20de%20la%20Bralima.pdf. ODM (Indicadores de los Objetivos de desarrollo del Milenio), (2013). Consumo de CFCs que deterioran la capa de ozono, en toneladas métricas de potencial de deterioro del ozono; no data; [ Links ] [updated no data; cited 2013 Nov 26]. Available from: http://mdgs.un.org/unsd/mdg/SeriesDetail.aspx?srid=649.